In recent years, some research has focused on boron-nitrogen-based (B-N) hydride compounds because they are able to store and release significant quantities of H2. Of the compounds, the simplest, ammonia borane (AB), is particularly promising because it does not suffer from self-hydrolysis in water, it has a high H2 content, low molecular weight, is non-toxic and has particularly high stability in both aqueous solutions and air–it has great potential for on-board applications in transportation. These drawbacks motivated the researchers, led by Dr. Kyriakos C. Stylianou of EPFL and NCCR MARVEL, to try to find better catalysts. Ideal candidates should be based on abundant elements, air stable, and easily regenerated, stored and handled. Of all these strong points, the researchers considered regeneration, or self-healing–the ability of the catalyst to spontaneously repair itself during normal operations–to be the most attractive. Indeed, it’s critical for practical applications because the catalyst’s stability is directly linked to its economic viability. 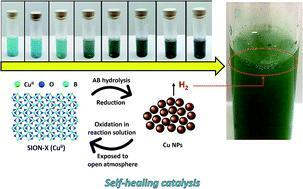 “The self-healing catalysis of SION-X in the absence of any extra energy input gives a new perspective in heterogeneous catalysis for energy-related applications,” the researchers said.